Thank you to our parents for sending the items for the Lunches for the Homeless and Hungry. We will collect again after the Passover Holiday. As you are aware, most of our local Public Schools will be closed on Thursday, April 18, therefore, the Thursday Hey class will not meet on that day. Our last class day before vacation is today, Wednesday, April 17, 2019 for the Aleph through Dalet classes. Classes will resume on Monday, April 29, 2019. On Wednesday, May 1, 2019, the Aleph through Dalet classes are attending a Yom Hashoah Program in the Sanctuary during class time. This is the first class day for Aleph through Dalet after the Passover Break. Any student arriving more than ten (10) minutes late to class MUST BE ACCOMPANIED BY A PARENT who must sign a book located in the Hebrew School Office. This is to ensure that all of our students arrive safely in their classes. Many of you have asked about sponsoring the "Kosher Kart". The sponsorships are only $36 each. Available dates are: May 1, 8, 22, and 29, 2019. If you sign up for a date, your child will have the opportunity and privilige to sell the Kosher Kart on that date. All the kids enjoy selling. Our Hebrew School students participated in a Model Seder last Sunday, April 14, 2019, assisted by some of our Hey students. The Bet and Hey Classes prepared many delicious foods for our enjoyment and they were scrumptious. A special Todah Rabah to Rabbi Bernstein for creating the Haggadah which we used so successfully this year (and for many years to come) and for her enthusiastic, vibrant leadership at our Model Seder. A "Tip of the Kippah" to both Cantor Kowitz and to Mr. Bruce for their excellent integration of the musical component of our Model Seder. The Kindergarten and Primary Class: The students have learned about Passover, including the Seder prayers. In Art, they made many projects for the students to use at their own seder. The Pre-Aleph Class has completed most of their Hebrew book learning the Hebrew letters and vowels. Please note that the Pre-Aleph and Aleph Class Shabbat is scheduled for Friday, May 31, 2019. Aleph: Both Aleph classes have learned the prayers for Passover. Both Aleph classes have completed their "virtual" travels in Israel and are returning to New York. Bet: The Bet students have been focusing on Aleynu and they can now read it in its entirety. They have worked from from the Haggadah to prepare for their own Seder. They are excited to use their new Siddur as they continue to prepare for their Bet Class Shabbat Service which is scheduled for Friday, May 10, 2019 at 8:00 PM. Please wear a white shirt and a dark bottom for the service. Todah Rabah to all of the Bet students and to Chef Arkin for preparing such delicious foods for our Model Seder. Gimel: The Gimel students are focusing on their Hebrew reading and are doing well. They are still concentrating on their Friday night prayers for their Class Shabbat as well as learning the prayers for the Passover Seder. Please note that your Gimel Class Shabbat has been re-scheduled for Friday, May 17, 2019 at 8:00 PM. Please wear a white shirt and a dark bottom for the service. Dalet: The Dalet Class is thinking about how important services are as they prepare for their own Bar or Bat Mitzvah Service. They are also focusing on the important role that Judaism has in their lives. The current "hot topic" in their class is now Yom Hashoah. The students will continue to work with Yoav on the customs and cultures of Yom Hashoah in Israel. Hey: A reminder: Hebrew High classes meet on Tuesdays from 7:00 PM until 8:40 PM at the Merrick Jewish Centre. The Hey students are discussing relevant Jewish topics relating to the issues that face Jews of America and the world. The Hey students have been working very hard learning the prayers for their Bar / Bat Mitzvah. I encourage you to attend Shabbat services in the Main Sanctuary to improve your comfort level for your child's Bar or Bat Mitzvah and to strengthen your child's Hebrew reading. They have begun studying the stories and prayers for Yom Hashoah. They prepared many delicious foods for the Hebrew School Seder last week, and some volunteered to help out before, during and after the Model Seder. The Hey students will present their Holocaust Projects to the Congregation on Wednesday, May 1, 2019 at 7:00 PM at the Yom Hashoah Program. I hope that you have all received the Hebrew School Calendar. If you have any questions or concerns about it, please contact June at SchoolAdm@cbohr.org. Please keep your eye on the Calendar, as we update it regularly. Our next Junior Congregation date is Saturday, May 4, 2019, followed by May 11, May 18, and June 1, 2019. It always starts at 10:30 AM in the Muraskin Room. Please keep in mind that there are only four more Junior Congregation Services until school ends. Remember that in order to become a member of the Chai Club, you must attend 18 services. We hope that everyone will attend. A special Todah Rabah to Cantor Kowitz and Sheryl Gordon who work with our Junior Congregation so beautifully. HEY STUDENTS: Please make sure that you let the Junior Congregation Leader know when you attend services in the Main Sanctuary so that you may receive credit for having attended Shabbat services. For any student who has attended a service here at Congregation Beth Ohr and there is no scheduled Junior Congregation service, please email June (SchoolAdm@cbohr.org) with the date. The next Board of Education meeting will be held on Monday, May 20, 2019 at 8:00 PM in the Muraskin Room. I want to let you know that the guarding sign up is active and if you want to find an hour to devote to honoring those who perished, you can do so by going on the bottom link. It begins the evening of May 1 (Wed). We are trying to make it so people can sign up solo, but right now, you must have one other person (or more) with you. Please try and ask someone to sit with you. It's not for conversation. It is so that no one is ever alone in the building and one person can go open the door while the other sits with the candles. 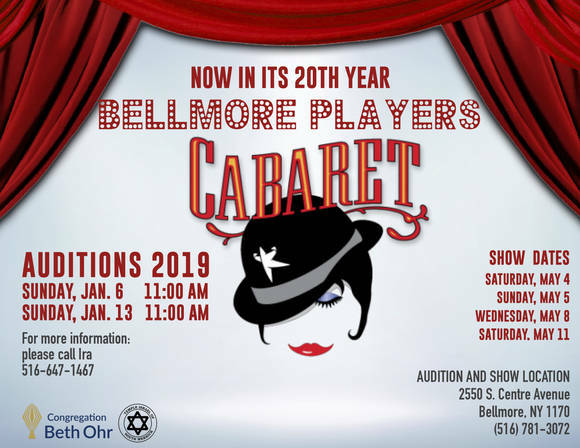 Please see the flyer below for our 20th year of Bellmore Players Cabaret. I am also thrilled to share with you that many of our talented students, teachers, and educational assistants are performing in the Cabaret. Please come to one of the four shows to show your support for Mr. Bruce Katz, our creative Music Teacher, Ms. Heather Kanner, our talented and gifted Aleph Teacher, Breena Nachbar, our chanteuse extradonaire and Educational Assistant, and our six wonderful Bet Thespians, Madison Brand, Lila Goldman, Alanna Romanick, Ava Rousseau, Daniella Schneider and Emily Schoenberg. As always, my door is open to embrace all your suggestions, concerns and ideas. On behalf of my dedicated staff, Steve and I would like to wish you and your families a Very Sweet Passover Festival. Please consider "joining" Congregation Beth Ohr on Facebook. There are two groups, CBO Tots , and CBO/TISM Parents. Please "Like" our Congregation Beth Ohr page. It is a great way to keep in touch with everything happening at our synagogue. Our last class day before vacation is Wednesday, April 13, 2019 for the Aleph through Dalet classes. Classes will resume on Monday, April 29, 2019. Many of you have asked about sponsoring the "Kosher Kart". The sponsorships are only $36 each. Available dates are: April 17, May 1, 8, 22 and 29, 2019. Thank you to the Meirowitch family in honor of Shane's birthday. Our Hebrew School students are participating in a Model Seder this Sunday, April 14, 2019, during Hebrew School Class time in the Social Hall. This is for the Kindergarten through Dalet Classes. All students are expected to attend classes at the regular time, and will participate in the Model Seder at approximately 10:45 AM. We would like all of our Hey students to assist at the Seder and we are offering Community Service to all who attend. The Bet and Hey Classes are preparing many delicious foods for the Model Seder. The Kindergarten and Primary Class: The students are begining to learn about Passover, including the Seder prayers. In Art, they are making many projects for the students to use at their own seder. The Pre-Aleph Class is learning new Hebrew letters each week. They are also learning new brachot and new Passover songs. In Art, they are making many projects for the students to use at their own seder. Aleph: Both Aleph classes are starting to learn the prayers for Passover. Both Aleph classes are enjoying their "virtual" travels in Israel. Bet: The Bet students have been focusing on Aleynu and they can now read it in its entirety. They are also working from the Haggadah to prepare for our Hebrew School Seder (this Sunday, April 14, 2019). They have been discussing the symbolism found in the Seder. They are excited to use their new Siddur as they continue to prepare for their Bet Class Shabbat Service which is scheduled for Friday, May 10, 2019. Please note that your Gimel Class Shabbat has been re-scheduled for Friday, May 17, 2019. Dalet: The Dalet Class is begining to think about how important services are as they prepare for their own Bar or Bat Mitzvah Service. 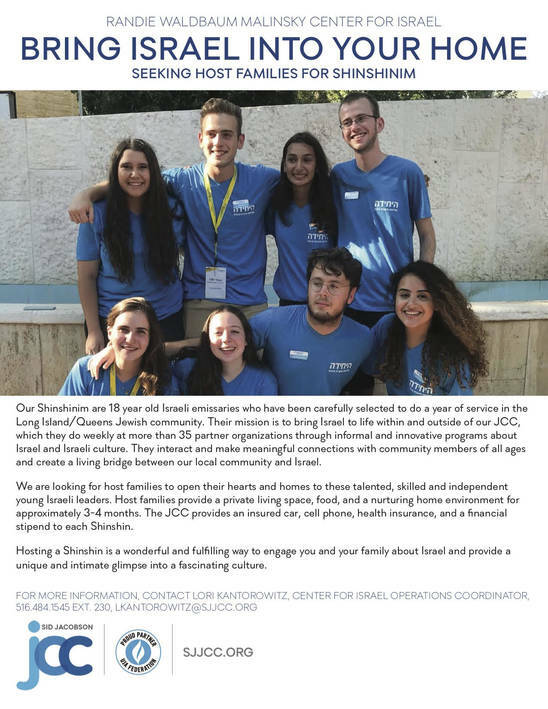 They are also focusing on the important role that Judaism has in their lives. The current "hot topic" in their class is now the Passover Seder. The students will continue to work with Yoav on the customs and cultures of Passover in Israel. The students are diligently analyzing the Haggadah for our School Seder this Sunday, April 14, 2019, during class. They have begun studying the stories and prayers in the Haggadah. They will prepare many delicious foods for the Hebrew School Seder this Sunday, April 14, 2019. Our next Junior Congregation date is this Saturday, April 13, 2019, followed by Saturday, May 4, 2019, then May 11, May 18, and June 1, 2019. It always starts at 10:30 AM in the Muraskin Room. Please keep in mind that there are only five more Junior Congregation Services until school ends. Remember that in order to become a member of the Chai Club, you must attend 18 services. We hope that everyone will attend. The next Board of Education meeting will be held this Monday, April 15, 2019 at 8:00 PM in the Muraskin Room. To help your students become more proficient in reading Hebrew, Rabbi Bernstein is offering a class which will enable you to read with your child. The class is called "Hebrew Reading for Hebrew School Parents" and will be held on Sundays at 9:30 AM, begining February 3, 2019. For your convenience, you can join the class when you drop off your child at school. As always, my door is open to embrace all your suggestions, concerns and ideas. Thank you to our parents for sending the items for the Lunches for the Homeless. You can still donate items this Sunday, April 7, 2019. Many of you have asked about sponsoring the "Kosher Kart". The sponsorships are only $36 each. Available dates are: April 3 and 17, May 1, 8, 22, 2019. Our Hebrew School students are participating in a Model Seder on Sunday, April 14, 2019 starting at 10:45 AM, during Hebrew School Class time in the Social Hall. This is for the Kindergarten through Dalet Classes. We would like all of our Hey students to assist at the Seder and we are offering Community Service to all who attend. Both Aleph classes are enjoying their "virtual" travels in Israel and about to leave Jerusalem. Bet: The Bet students have been focusing on Aleynu and they can now read it in its entirety. They are also working from the Haggadah to prepare for our Hebrew School Seder (Sunday, April 14, 2019). They have been discussing the symbolism found in the Seder. 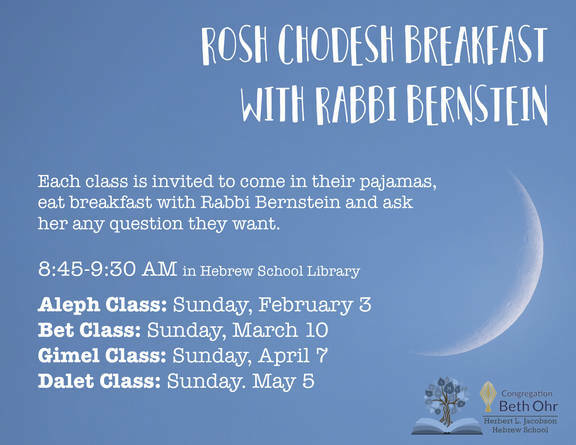 Save the date: On Sunday, April 7, 2019, the Gimel Class will celebrate Rosh Chodesh Breakfast with Rabbi Bernstein. Come in your pajamas. Please keep in mind that this starts at 8:45 AM in the Library, and will end in time for class to begin. Todah Rabah to Rabbi Bernstein for leading different classes and an outstanding job each month. The students are diligently analyzing the Haggadah for our School Seder on Sunday, April 14, 2019, during class. They have begun studying the stories and prayers in the Haggadah. They will prepare many delicious foods for the Hebrew School Seder on Sunday, April 14, 2019. Our next Junior Congregation date is this Saturday, April 13, 2019, followed by Saturday, May 4, 2019, then May 11, May 18, and June 1. It always starts at 10:30 AM in the Muraskin Room. Please keep in mind that there are only six more Junior Congregation Services until school ends. Remember that in order to become a member of the Chai Club, you must attend 18 services. The next Board of Education meeting will be held on Monday, April 15, 2019 at 8:00 PM in the Muraskin Room. Thank you to our parents for sending the items for the Lunches for the Homeless. Your items are due this Wednesday, April 3, 2019. Thank you to the Gordon / Pludwin Family in honor of Haley's birthday. The Hey Class is preparing many delicious foods for the Model Seder. Save the date: On Sunday, April 7, 2019, the Gimel Class will celebrate Rosh Chodesh Breakfast with Rabbi Bernstein. Come in your pajamas. More information will follow. Please note that your Gimel Class Shabbat has been re-scheduled for Friday, May 17, 2019. Please refer to the email sent earlier this evening. The students are diligently analyzing the Haggadah for our School Seder. Our next Junior Congregation date is this Saturday, March 30, 2019. The next one is on Saturday, April 6, 2019 followed by Saturday, April 13, 2019. It always starts at 10:30 AM in the Muraskin Room. We hope that everyone will attend. A special Todah Rabah to Cantor Kowitz who works with our Junior Congregation so beautifully. Cantor Kowitz is offering a Trope Chanting class on Mondays at 7:00 PM. Thank you to all participants and volunteers at the Mel Polay Purim Carnival last Sunday, March 17, 2019 at Temple Israel of South Merrick. A great time was had by all. Congratulations to our Congregation Beth Ohr Hebrew School winners of the four Annual Themed Shalach Manot Baskets and of the 50/50 winner. Thank you to our parents for sending the items for the baskets, and a special thank you to Ms. Ilene who assembled them so beautifully. A special Todah Rabah to the Weisbord family for sponsoring the delicious pizza which we all enjoyed last evening, on Purim. It is in celebration of the newest bundle of joy to the Weisbord / Loeb family. Thank you, Joey, for all that you do to help support our Hebrew School. Thank you to the Reiner Family in honor of Ethan's birthday. The Kindergarten and Primary Class: The students are begining to learn about Passover, including the Seder prayers. The Pre-Aleph Class: is learning new Hebrew letters each week. They are also learning new brachot and new Passover songs. Both Aleph classes are enjoying their "virtual" travels in Israel and their next stop is Jerusalem. Bet: The Bet students have been focusing on the Kiddush and they can now read it in its entirety. They will be studing the history of Modern Day Israel over the next few weeks. They have already started to learn the prayers for the Passover Seder. Please note that your Gimel Class Shabbat is scheduled for Friday, April 12, 2019. A "Tip of the Kippah" to the Dalet students who volunteered at our Purim Carnival last Sunday. They have begun studying the stories and prayers in the Haggadah. A "Tip of the Kippah" to the Hey students who volunteered at our Purim Carnival last Sunday. Our next Junior Congregation date is Saturday, March 30, 2019. The next one is on Saturday, April 6, 2019 followed by Saturday, April 13, 2019. It always starts at 10:30 AM in the Muraskin Room. We hope that everyone will attend. The next Board of Education meeting will be held on WEDNESDAY, March 27, 2019 at 8:00 PM in the Muraskin Room. PLEASE NOTE THE CHANGE IN DAY AND DATE.